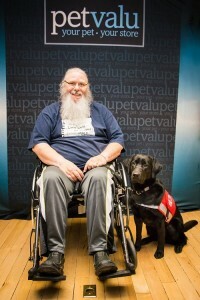 Jerry & Ultra | Giving Back ";s:21:"divi_integration_body";s:415:"
Jerry and his Dog Guide Ultra, from Calgary, AB, graduated from the Hearing Ear program in March 2016. Jerry has been married for 39 years and is a proud father of two and grandpa to four. It was around age 40 when Jerry lost his hearing, from unknown causes. The transition was not easy for Jerry and his family, with two teenagers and difficult times ahead. “I lost my hearing, my livelihood, my friends and even most of my family walked away because they don’t know how to handle my deafness,” recalls Jerry. A few years ago Jerry also became wheelchair bound. Jerry started his journey with Lions Foundation of Canada Dog Guides two years ago after it was recommended to him by his uncle, who is involved with the Lions in Sylvan Lake, AB. “At first I didn’t think having the dog would make that much difference to my life but I couldn’t have been more wrong,” says Jerry of his experience training with Ultra; “Ultra has made a HUGE impact in my life and my wife’s life too.” Ultra is a happy dog who not only helps Jerry, she also loves to play and helps get Jerry out and active. Since welcoming Ultra into his life and family, Jerry has become aware of the little things that mean the world to him and his family, such as be altered when his wife calls his name or grandchildren call ‘Grandpa’. Ultra is trained to alert Jerry of the door, alarms and timers, people calling and pick things up off the ground. Ultra has also learned how to use the wheelchair button to open doors for Jerry. Ultra was put to the test when Jerry’s wife became ill and fell, hitting her head and becoming unconscious, Ultra did everything in her power to alert Jerry and bring him to help his wife, “It’s always been a fear for me that with my being deaf something might happen to Pauline and I wouldn’t know,” says Jerry. Ultra has helped Jerry regain his confidence, and get involved in his life again. “The impact on my life is astronomical because really, she affects almost every part of my day. She’s everything from friend to protector and I love her immensely,” remarks Jerry.